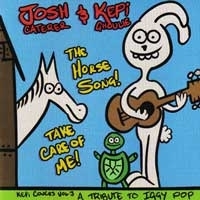 Kepi Covers Collection Vol 3 : Iggy Pop featuring Kepi and Josh Caterer of the Smoking Popes. Hand Numbered pressing of 600 with original cover art by Kepi. 500 on green vinyl. 100 on clear vinyl. THIS IS THE GREEN VINYL 7" we are sold out of the clear vinyl!